Our company mission at SeaBenefit is to provide only the highest-quality natural sea cucumbers to our consumers. We recognize the importance of sustainable, environmentally conscious methods of harvesting and distributing sea cucumbers worldwide - the importance of sea cucumbers to both humans and our global environment is our top concern. We only do business with authorized and licensed fisheries that comply with international wildlife and conservation regulations. SeaBenefit Wild-Caught Sea Cucumbers are a nutrient-rich superfood famous for its supplementary benefits for reproductive health, immunity, and joint relief for conditions including sprains, tendonitis, and arthritis. These "immortals of the ocean" are highly desired not only as banquet delicacies, but for their key role in maintaining good health and reducing health from natural organic foods. Sea cucumbers are incredibly low in calories, with only 95 calories per 6 ounces. The majority of the calories are derived from sea cucumbers' 22 grams of protein per 6 ounces. According to the US Department of Agriculture, a single serving of 6 ounces of sea cucumber already fulfills the minimum daily intake of protein required. HYDRATE. Place a few pieces of sea cucumber in a pot with cold water for 12 hours. Cover the pot. CHANGE WATER. After 12 hours, change the water, cover the pot, and boil. Once the water boils, turn off fire, and let it soak for 12 more hours. REPEAT. Repeat Step 2 three times. Depending on the sea cucumber size, full hydration can take 2-4 days. CLEAN. Once the sea cucumber has softened, clean away any impurities from the inside of the sea cucumber. Time to cook! SIZE: SeaBenefit NA Barbed Star Sea Cucumbers range in length from 3-5 in. inches. When fully hydrated, these sea cucumbers will increase in volume by 3-5 times. Larger sea cucumbers generally have a denser consistency and better absorb flavors from sauces and dishes. For preparation instructions, see the product description. 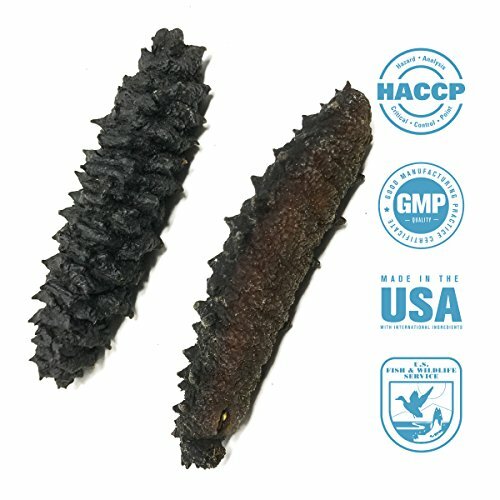 NATURAL: All SeaBenefit sea cucumbers are wild-caught, GMP & HACCP certified and U.S Fish and Wildlife service approved. All of our products are processed, distributed, and sold in the U.S.
HEALTH BENEFITS: Wild sea cucumbers, naturally grown on ocean floors, are enjoyed not only as delicacies, but as superfoods with zero-carbohydrate, high protein content. Sea-cucumbers are well-known for reproductive enhancement, as well as anti-inflammatory and joint relief properties. HUMANE: 100% of our sea cucumbers are wild caught. We do not purchase any products from artificial sea cucumber farms, and we only work with legally-authorized suppliers in compliance with international fish and wildlife conservation laws. If you have any questions about this product by SeaBenefit USA, contact us by completing and submitting the form below. If you are looking for a specif part number, please include it with your message.